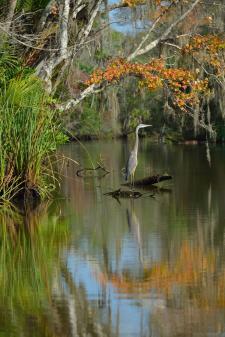 Like the people who flock to Daytona Beach to soak in the warm sunshine, many birds thrive in the area’s mild climate. From viewing majestic native fowl to spotting seasonal migratory species, birding in the Daytona Beach area is boundless.This part of Florida is home to a number of what are considered “specialty birds,” including the wood stork, bald eagle, clapper rail, American oystercatcher, Florida scrub jay, magnificent frigate bird, reddish egret, roseate spoonbill, swallow-tailed kite, painted bunting, piping plover, peregrine falcon, American avocet and so many more! Join the environmental specialists at Lyonia Preserve and Environmental Center on Mondays and Fridays for a free guided “Scrub Stroll.” You’ll get an up-close view of Florida scrub jays, curious and friendly birds that are generally interested in getting a closer look at you, too. After your walk, explore the hands-on displays and innovative, computer-based learning modules that teach about Volusia County’s unique environment. Plus, the center features saltwater and freshwater aquariums, as well as an amphitheater for educational programs. Come and learn about what makes the area’s ecosystem so special, as well as the challenges that it faces. Along the eastern section of the Great Florida Birding Trail is Ponce Preserve, an excellent spot for bird-watching enthusiasts. 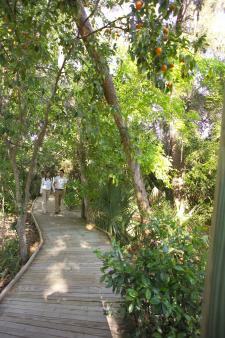 Spanning 41 acres of scenic park land between the Halifax River and the Atlantic Ocean, it is a haven for native birds. 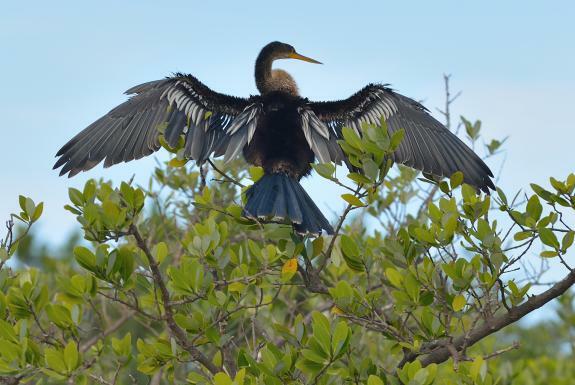 With a varied terrain ranging from ocean dunes to wetlands to patches of palmetto trees, the preserve offers a diverse population of birds and native plants to observe. While you’re there, explore the Green Mound State Archaeological Site, an ancient Indian midden. At its base, you’ll discover a live oak tree that is estimated to be nearly four centuries old! This Ormond Beach spot is considered a bird-watcher’s paradise — especially during the spring and fall migrations — with over 160 species spotted on site. Here, bird-watching can take place by foot on the nature trails, or by canoe or kayak along the riverfront. Native Americans once dwelled in the area and lived off of the lagoons, which are brimming with fish. If you’re lucky, you might even spot a West Indian manatee! Snacks, personal watercraft rentals and more are available at the state park, as well as full-service campsites for those who wish to stay a bit longer and explore. Cruise down a 34-mile loop full of picturesque scenery and an abundance of wildlife. Exploring the Ormond Beach Scenic Loop is a favorite activity for both locals and long-time residents, and offers a glimpse into Florida’s natural beauty. The loop offers many diversions down nature trials that make for wonderful birding, namely along Boardman Pond. Want to experience nature with the salty breeze running through your hair? Check out this list of bicycle rental options available — birding and bicycling makes for a fun outdoors adventure! If you’re interested in birding on your next visit to Daytona Beach, be sure to review the Halifax River Audubon’s more comprehensive guide to bird-watching in the greater Daytona Beach area. And, if you capture any images of the birds you come across, be sure to tag us on Facebook and Instagram when you post them!